Obesity in dogs is almost as common as obesity in humans. 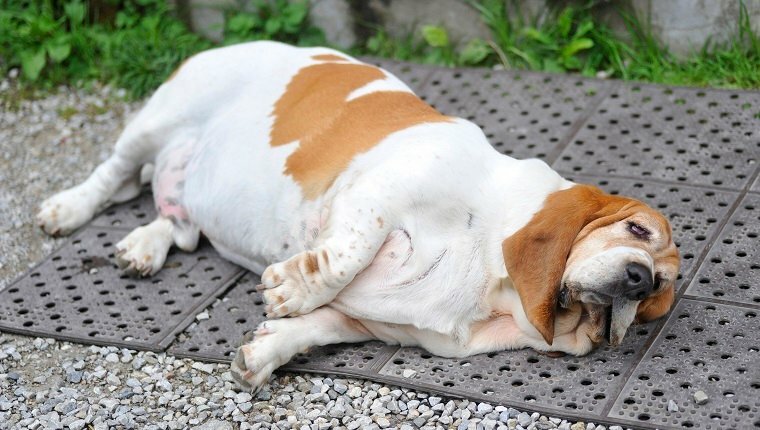 In fact, experts say an estimated 56 percent of dogs are overweight or obese in the United States. The health consequences of these extra pounds are just as serious, too: overweight dogs put greater stress on their joints, hearts, lungs, liver, and kidneys. They’re more prone to injury, and are at a higher risk during surgery. And it probably doesn’t feel good to them, either. Fat dogs don’t have the energy or the natural curiosity and playfulness that fit dogs do. Although dogs can’t decide to go on a diet or exercise more, they definitely appreciate life a whole lot more when they’re trim and ready for action. Some dogs have physiological reasons for obesity, but weight problems are mostly the result of two factors: too much food and not enough exercise. 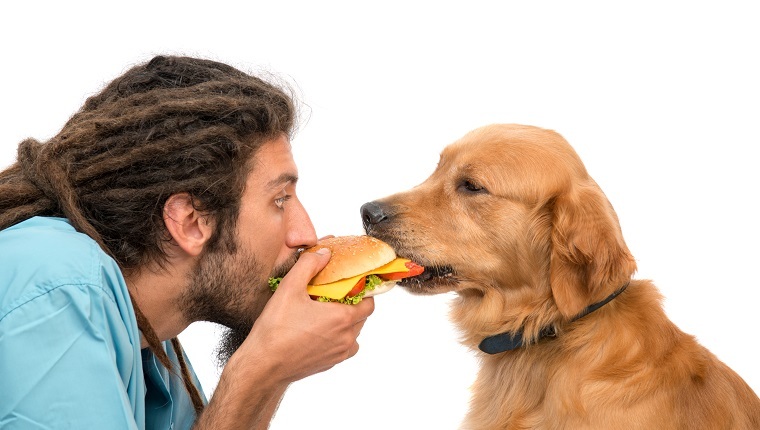 Overeating for a dog is a matter of overfeeding–overly generous portions, between-meals snacks, and table scraps. 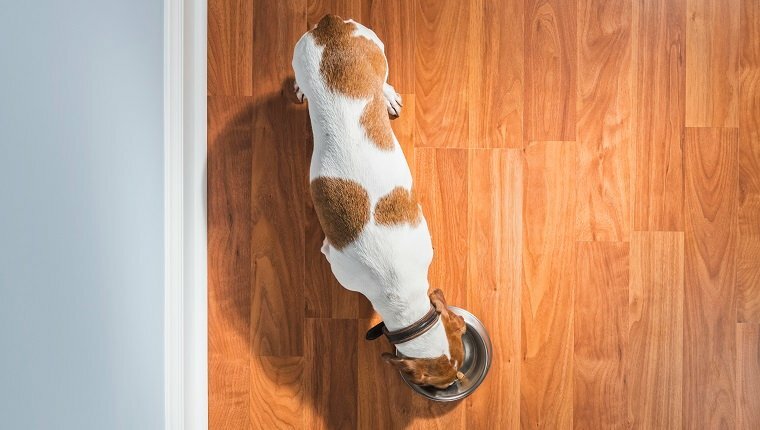 Sometimes the owner mistakenly believes that a dog needs access to food 24 hours a day, or that dogs only ‘ask’ for more food when they’re truly hungry. Not true. Dogs are natural scavengers, and if they learn that a certain look will yield more food, they’ll ask for it over and over, whether they’re hungry or not. Lack of exercise–it’s the same problem we humans have. Dogs generally confined indoors or in yards don’t get the exercise they need–and no, dogs won’t ‘automatically’ exercise any more than humans. They’re just as lazy as we are. Fence-running and playing isn’t enough. If the dog isn’t exercising there will be slow but steady weight gain, leading to obesity in middle age. 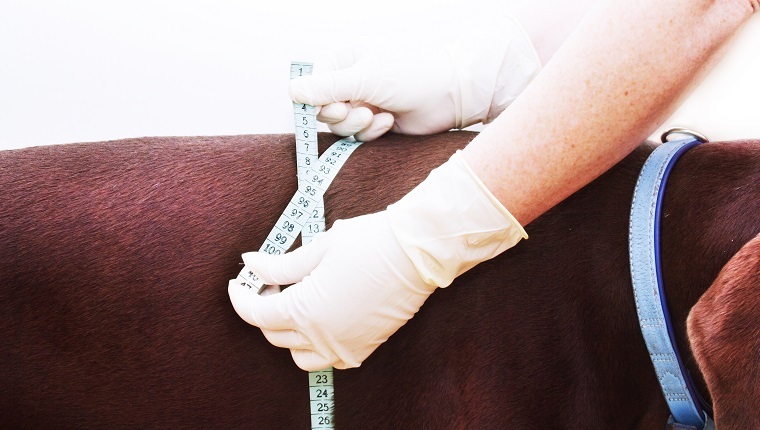 Spaying or neutering lowers dogs’ metabolism, but it’s rare that dogs gain a lot of weight solely because of that. What does happen: feeding and exercise plans don’t change with the age or condition of the dog. What’s fine for an active puppy is too fattening for an adult. It’s entirely controllable. A fixed dog doesn’t automatically equal a fat dog. Hormonal disorders such as an under-active thyroid gland, or hypothyroidism, can cause weight problems. A dog’s adrenal glands may produce too much of a hormone called cortisol, causing Cushing’s disease. Dogs with Cushing’s disease don’t actually gain weight, but their fat is re-distributed to the abdomen, making them look pot-bellied. Slowing metabolism happens in middle age. Research shows that middle-aged spread in dogs begins around age five or six, so if your dog is already overweight by then, the problem will probably get worse. Breed plays a role. If your dog is mixed-breed or purebred Beagle, Cocker Spaniel, Collie, Sheltie, Basset Hound, Dachshund, Lab, or Golden Retriever, beware. Check the ribs. Yes, there should be a little fat over them, but you should be able to feel them. If you can’t find them, you’ve got a problem. In fact, feel around for the major bones all over your dog’s body–legs, spine, shoulders, hips. If you have trouble finding any of them, then your pet has a bit too much padding. Check the breathing. If your dog breathes heavily even after little or no exertion, or has a hard time recovering from a short walk or play session, there could be a problem. Check the base of the tail. A little fat should cover this area, but if you can’t feel the bones at all, you dog is very overweight. Look down. Seriously, check your pet’s silhouette from above. Can you find a waist? Can you tell where the ribs end and the hips begin? Check the “abdominal tuck.” The tuck is the area behind the ribs. It should be smaller around than the chest. How much smaller depends on the breed, and the more deep-chested your dog, the greater the difference. A dog who’s too thin will have a very severe tuck, while a fat dog may have no tuck at all. You might want to consider keeping a log of food intake–including treats–and exercise, so you can monitor your pet’s progress. You might even have to get a little obsessive, measuring the exact amount of foods offered and noting every treat. No matter what the plan, be prepared for it to take a while. Inducing weight loss at a rate faster than two percent of total body weight per week is more likely to reduce lean tissue and trigger a rebound weight gain. Keep in mind that you’re in this for the long haul. Most dogs may take as long as long as eight to 12 months to reach their goal weights, and even then, they’ll need to keep up the diet and exercise to maintain their new, healthier shape. How do you keep your dog in shape and prevent obesity? What kinds of exercises does your dog do? Let us know in the comments below!